Left image: The original Japanese logo for Dairugger XV from the opening credit sequence. Captured from one of Arus' MPEGs. Center image: The D-XV logo appears in the corner of the screen to indicate a break into commercials. Right image: The D-XV bumper shown at the conclusion of commercial breaks. Both of these were capped from a fan-subbed download. Like virtually all other Voltron fans, I'd always known that Voltron originated in Japan. What I didn't know until a just a few years ago was that the collective Lion/Vehicle Voltron series was actually two distinct, non-related series in Japan. I'd always thought the series was unified from the beginning and WEP just dubbed over it! Lion Voltron was derived from the Japanese series "Hyakujuuou Goraion" (tr. Hundred Beast King Golion). Vehicle Voltron was derived from the series "Kikou Kantai Dairugger XV" (tr. Armored Armada Dairugger XV). WEP apparently also bought the rights to two other Japanese series, but never dubbed them: "Kosouku Raijin Arubegasu" (tr. Light Speed God Albegas, also known to Voltron fans as the infamously elusive "Voltron II"), and "Future Robo Daltanious." Shannon Muir's site has some info about Daltanious: According to her sources, Daltanious made its first and only TV appearance as a Voltron in a pilot epsiode that was released shortly before the full-blown Voltron series debuted. I personally have never seen this episode, but several reliable sources vouch for its existence. It was also released as a toy in America, but not as a Voltron toy. I've actually seen pictures of it in magazines. As for Albegas, the apochryphal Voltron II, my friend Danny recently emailed Megan at WEP and she was kind enough to answer this burning question once and for all: WEP actually never made nor intended to make a TV series out of Albegas. Matchbox, who made the Voltron toys back then, simply wanted the rights to make an Albegas toy because some people at Matchbox thought it would make a really cool toy! Matchbox thus released three Voltron toys: VV was known as Voltron I; Albegas was Voltron II; and LV was Voltron III. But WEP never produced a Voltron II/Albegas TV series. (Gee, this story sounds very similar to that of Trendmasters' abortive Voltrex toy, no?) Matchbox later dropped Voltron II from its toy line, and VV and LV were then renamed Vehicle Team Voltron and Lion Force Voltron, respectively. Some time after Matchbox dropped the Voltron toy line altogether, LFV and VTV became known as Lion Voltron (or just Voltron) and Vehicle Voltron, respectively, and of course remain so today. 1. At the beginning of the VV series, the Drules and the Galaxy Alliance were already longtime enemies. In D-XV, the Galbeston Empire (Drules) and the Alliance had never met before the series started. VV episode 1, "In Search of New Worlds", was heavily re-edited in order to establish an ongoing rivalry. 2. In VV, the Explorer's mission was to find new worlds to relieve their own overcrowded worlds. In D-XV, the Rugger Guard (Explorer) was apparently just exploring space, much like the Enterprise in Star Trek. There's no mention of overpopulation problems in the translated D-XV scripts on Arus' site. 4. Ever notice how most of the bad guys don't seem to stick around more than a few eps in VV? That's because in D-XV, they actually DIED. WEP just edited those parts out. In fact, ALL the bad guys died in the end: Viceroy Throk, Emperor Zeppo, et. al., and even Hazar. In the VV version, Zeppo, Throk, and all the other "bad guy" Drules simply "escaped" to another dimension. Obviously, WEP had to do some major editing of the 4-part VV finale (eps 49-52) to create such a different outcome. It's been rumored that WEP may have let one Drule death through: Mongo, Hazar's best friend. I've recently confirmed this to be incorrect, though, thanks to Purrsia. Mongo is said to have defected in "Hazar on the carpet" (ep 23), but from Hazar's reaction to that news it's a pretty safe bet that he was killed in D-XV. Captain Twyla from "This world's for the birds" (ep 38). Known as Captain Emma in D-XV, she died when her ship was destroyed. Valen from "It's anybody's world" (ep 43; this ep can be seen on WEP's video, "Whose solar system is it? ", minus the death scene of course). Known as Jackson in D-XV, he also was killed as his ship was destroyed; in VV, Valen "gets away" in an "escape ship." 6. In VV, almost all Drule robeasts were apparently "intelligent" enough to fight by themselves, although a few of them did have "robot" pilots inside. In D-XV the robeasts were often operated by live Galbestons inside. So when Dairugger destroyed the robeast, the pilot of course went with him. WEP edited out most of the scenes that showed these pilots, although a few were allowed through as "robots". Nefra, the Queen from "Planet of the Amazons" (ep 28). Some slaves from Vasamir in "Revolt of the slaves" (ep 29). Drule Lt. Antor from "That's the old ball game (ep 39). The VV version of the scene in which Antor's corpse is found by the VF is mainly voiceover that of course says he's OK, but it's SO obvious from everyone's non-verbal reactions that he's dead it's not even funny. ...and others that I'll list as I find them. 8. The beverages our VV heroes enjoy in the mess hall were often alcoholic in D-XV. In one of Arus' translated scripts, for example, the character we know as "Jeff" has a bourbon. 9. I've gotten to see the final D-XV ep, and while I was unable to understand the dialogue, I can say that the story ends pretty much the same as VV: Newley ("Asimov" in D-XV) and Hawkins ("Ise" in D-XV) meet Hazar's father Mozak, who begs for their help. The D-XV force and Alliance officers rush to help the Galbestons into Garrison escape ships before the planet explodes. Suddenly, all the ships are full, and they are forced to leave many Galbestons behind. Just as the ships have left, however, a new fleet of escape ships headed by Cmdre. Steele arrives just in time to save the remaining Galbestons. The main difference in D-XV is that Hazar ("Telesu" in D-XV) is stabbed to death by three young Galbestons. I'm not sure what their motive was, but after the attack there's a flashback to the death scene of Sandu from "A temporary truce" (ep 9, edited from VV of course). I'd guess they were Sandu's friends or brothers seeking revenge. Just before he dies, Telesu says something that really rattles his assassins, and they run away in what seems to be terror. Dorma and the D-XV crew find Telesu's body. Dorma weeps over his body, and Jeff leaves some kind of necklace by his body. Finally, after everyone has evacuated the planet, the Galbeston homeworld starts to disintegrate. We see the planet's surface open up underneath Telesu's body, which falls in. Finally, the planet explodes. 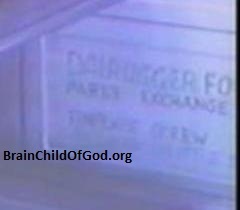 Near the end of "A very short vacation" (ep 9), there's a supply crate with the word "Dairugger" on it. Above is an image that I capped from that ep. I cropped the pic down to the crate itself; if you're looking for it in the ep, it'll be in the upper right hand corner. In "The Drules surrender" (ep 51) there's a brief shot of Zeppo sitting dead on his throne that WEP's editors overlooked. The D-XV logo appears in "Planet of the Amazons" (ep 28). If you happen to have this ep on video, cue it up to just before the fade-out into the second commercial (in the scene Queen Nefra says, "I'm a fool!" just before fade-out). Pause your VCR just before the fade-out ends and look closely at the lower right-hand corner of the screen. You'll see the logo for Dairugger XV (see images at the top of this page) that appears just before going into commercial break! Apparently WEP's editors tried to hide it with the fade-out effect, but didn't quite get it.